I had two showers today, one earlier at my hotel in Foz du Iguacu, Brazil and another one . . . a truly exhilarating one . . . at the Iguazu Falls, a UNESCO World Heritage Site. 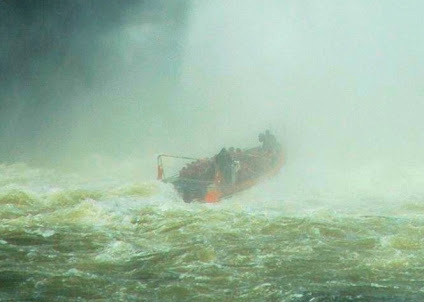 The powerful motorboat I was on, this in the Argentinian side of the falls, moved all the way to the base of the massive torrent of Salto San Martin, one of the many falls encompassing this behemoth of a natural attraction. Everyone of us got soaked but hey, that was part of the reason we did the boat ride. I screamed my heart out, deafened only by this montrous sound of falling water. There was just water, water, water everywhere. Earlier this morning, I was picked up at the hotel as arranged by Loumar Tourismo, the agency handling my sightseeing here. Three more joined me in the van, a Brazilian and two Dutch. We passed by Brazilian immigration without so much as saying hello to them and entered Argentina with our passports perused and stamped. We didn´t even leave the vehicle as our driver took our passports for stamping. It wasn´t as crowded along the border controls this morning so we managed to get into the Parque National Iguazu in a very short time. We all paid $14 (U.S.) at the park´s entrance, got our tickets and a very usable map. As I already have the Pasaporte Destino Iguassu, a packet of tickets that includes the motorboat ride and buffet lunch, I went straight for the wet experience. For visitors to get into the floating flatform where the motorboats await, we had to board an open truck first that goes right into the jungle. Lucky ones along this route will see wildlife (usually more active in the night) but we did manage to see an iguana scampering away and lots of butterflies hovering above as we move on. I told myself, this is not the Bronx Zoo anymore, this is the real deal. Like the Peruvian Amazon that I visited last year, the forest here is protected having been created as a national park since 1934 by the Argentinian government. This natural sanctuary comprises an area of more than 67,000 hectares - with enough flora and fauna to justify its status even if the falls were not there. The Iguazu name is derived from Guarani - a tribe that existed during the Spanish conquistadors - with "I" meaning water and "Guazu" being big. The natives simply called it that and the name stuck to this day. We boarded the motorboat and was given all this airline-like safety instructions - this time, we´re actually putting on the life vests. Waterproof bags were handed out for storing our digital valuables but the guides were great enough to allow us to take photos until we´re told to pack them up. It´s about 6 kms. of sailing against the current along the Iguazu river canyon with the occasional shrieks from the passengers as the boat bobbed up and down. At the long end of this canyon, I had my first glimpse of the falls, being seated right at the front of the boat. We were immediately teased by the falling waters of Salto Dos Mosqueteros, before being soaked by the biggest thrill of them all - the Salto San Martin. After drying myself up, I clambered up the steps along the Lower Circuit to get a more dramatic view - with a time to really soak the view in. I´m not surprised that Eleanor Roosevelt once proclaimed "Poor Niagara, this makes it look like a kitchen faucet" when she first saw the mighty falls. Indeed, Iguazu Falls is much wider and higher than its northern American cousin which of course means more volume of water falling at any given time. Another glaring difference is that Niagara has lost its natural charm, especially on the Canadian side due to its Las Vegasfication: hotels with casinos. I decided at this point to grab my lunch at Fortin Restaurant. There was a buffet spread and since I know that Argentina is known for its beef, I just had to sample what this restaurant had to offer. I couldn´t care less about cholesterol - Argentina beef is it! There I was, slicing chunks of this meat while thinking about my next destination this afternoon, the Upper Circuit and the mother of them all, the Garganta del Diablo. The meat, at least as cooked here, didn´t impress me at all. There was just no excitement to it that I didn´t take a second serving. I finished my meal with a fruit desert. As the name suggests, the Upper Circuit navigates along the very top of the falls. I was merely looking down at what I was gazing up earlier in the boat. The heat at this hour and the hordes of tourists elbowing each other for the view has become unbearable that I dashed towards the Estacion Cataratas for the train ride to see the Garganta del Diablo. There I meet Nami, a 27-year-old Japanese woman on a three-month solo escapade around South America. We talked about the joys of travel - as always, this is what happens when I meet fellow travellers down the road: Hi, where are you from? When did you arrive here? Where are you headed to next? It´s in a moment like this where like-minded people ultimately win each other´s companionship even if it´s just fleeting. 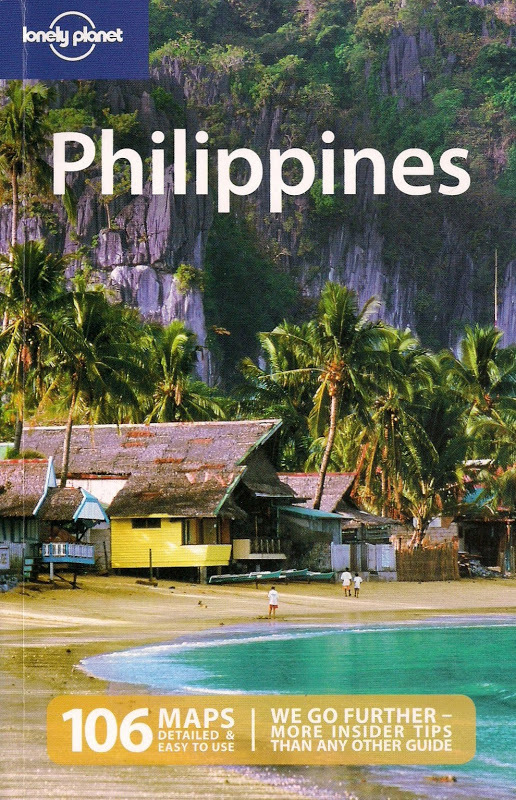 So Lonely Planet, isn´t it? The Garganta del Diablo or the Devil´s Throat, is an awesome sight. In this U-shaped waterfalls, a massive amount of water falls down some 80 meters below creating a mist, a rainbow and a blaring jukebox that only Mother Nature can generate. Paparazzi among the tourists have a field day here - snap, snap, snap is the order of the day. I had to catch the 4:00 p.m. ride back to Brazil so I said my goodbyes to Nami who buzzed me on the cheek - I bid her a safe journey for the rest of her trip. At the Visitor´s Entrance, Mercio, my driver yesterday spotted me right away. He´s taking me back, along with the two Dutch and one Brazilian, to our hotels. Mercio thought we shouldn´t end the day without stopping by at the point where the borders of Argentina, Brazil and Paraguay meet. There we were, at a vantage point, looking down at Parana river where Iguazu river joins in - to our left is Paraguay, the right side is Brazil and this soil we were standing on is Argentina. To mark that visit, the four of us visitors stood by the markers for the obligatory photo shoot. From Spanish-speaking Puerto Iguazu, Argentina, we re-entered Portuguese-speaking Foz du Iguacu, Brazil. Come to think of it, we´re switching not just currencies but language again in less than an hour. I´m just fortunate that my infantile Spanish has survived the onslaught of Portuguese (they understand Spanish) - I managed somehow to make myself understood with my Shakira body language. What a world, what a diverse world indeed! Stunning images that encourage me to do the same - visit this beautiful country! Im sure you did a wonderful trip.